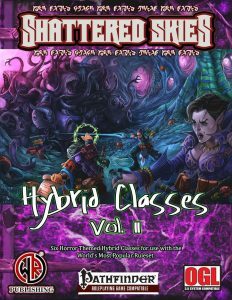 The second compilation of Wayward Rogues‘ hybrid classes clocks in at 65 pages, 1 page front cover, 1 page editorial/ToC, 2 pages of SRD, 1 page of back cover, leaving us with 60 pages of content, so let’s take a look! Well, I have covered a lot of these before in their stand-alone releases, so let’s just revisit them briefly before checking out the Bullet Disciple, shall we? The dimensionist has obviously gotten a bit of a facelift: While the rules-language for non-euclidean intrusion is a bit less refined regarding its wording, it now thankfully talks about its action economy…and its daily uses have been nerfed down to 1/day at first level, +1/day at 7th and 15th level. The ability also still lacks a range. Unfortunately, this results in quite a few dead levels characterized exclusively by a new spell slot, not necessarily even a new spell level reached. Spell distortions are not freely choosable and are presented in a painfully non-standard formatting. Speaking of formatting and confusion: Some abilities are after the capstone – some of which previously were distortions. And at 17th level, the class, weirdly, notes “Nimble +5” in the table. This is…worse than in the stand-alone version. The italicizations are still missing left and right and the archetypes are similarly nothing to write home about. Ouch. Okay, so no improvement there, what about the incarnate? Well, we still have dead levels. We still have partial redundancies (the base class gains martial weapon proficiency) and a revelation of a mystery nets access to that and Exotic Weapon Proficiency for all such weapons. A lot of the revelations still lack their activation action. Abilities still have not been codified properly. The librarian still fails to specify how many memory points he actually gets. Lightning instead of electricity…it’d have been a few minutes of work to make this class work properly. It’s so close. A single capable rules-dev could have done so in less than half an hour. Alas, it has been taken 1:1 from its pdf. …well, on the plus-side, there are two new archetypes for the librarian: The Bibliophile, that replaces instant study and quick study with halving the required rest duration for his race and 14th level providing immunity to starvation, thirst and sleep for as long as the librarian has a new book to read. This is cool, but does it allow for the preparation of spells after the brief rest period? Instead of bestow knowledge with the “my favorite part” ability, usable 3 + Charisma (not properly capitalized) modifier times per day – these would btw. be full-round action buffs for nearby allies. The archetype’s relatively solid. The second librarian archetype would be the exotic ecologist, who can roll d20s when interacting with creatures analyzed twice, taking the better result 3/day, +1/day for every 3 levels after 3rd, replacing bestow knowledge. Yeah, that translates to the equivalent of advantage. And I do not really get what “re-learn” means. Ability-gains are btw. not in sequence and at 2nd level, you can treat non-humanoids of several creature types, even mindless ones, as humanoids, which can be OP. The other two abilities, providing eidetic memory interaction (doesn’t work in the base class) as well as tongues – which is obviously not italicized, and a surge-like bonus on Charisma skill checks…which is not adhering to PFRPG-rules-language. There are several feats for the librarian, which include using books as weapons. And guess what? The feats even manage to screw up properly noting the damage type of these books. They also impose save penalties and another feat nets +1 use of eidetic memory or +2 bestow knowledge uses. Erasing a spell with a descriptor allows you to temporarily erase a creature’s resistance to the energy for 1 round…which is interesting, though wonky in wording. The revanchist’s sense murder still doesn’t work properly. The class still makes no real sense to me and still has some serious balance-and versatility-issues. The class now gets an archetype, the territory shepherd can form a bond with a limited number of allies, helping their overland movement and healing while resting. Instead of oath of vengeance, judgments apply to all allies in the aforementioned bond instead and the broken sense murderer is replaced with teamwork sharing The higher level abilities further enhance this tactician-y style. The big plus here: The archetype is MUCH better than the base class. The downside: Dreamscarred Press’ tactician and several other classes like the Battle Lord do everything this one does…better. As in more diverse, more interesting, more options. And no, formatting’s not perfect here either. Next. Vivisectionist…oh dear, please let them have fixed this guy, he’s so cool! (And he’s not among the bookmarks. Odd. *brief read-through. Nope. Swift alchemy still contradicts the table. Rules-nomenclature’s still non-standard in cases. Ach, come on! The spells from the original pdf have been included. The vivisectionist also gets an archetype here – the chirurgeon, who gets a healing touch instead of channel negative energy as well as Turn Undead and a quasi-channel that only works in conjunction with the feat. The fear aura is replaced with a buff, life bond replaces vivisection and we get better healing, life sight and later, anti-death effect-boosts and a save, even when usually none would be allowed. Okay, what type of save? I like the idea of a non-evil vivisectionist, but this does have a few hiccups as well. …okay, so, up next would be the new hybrid class herein, which is yet another combo of monk and gunslinger. If I had a dime for each take on that combo I have analyzed…Anyways, these guys need to be lawful, get d10 HD, 4 + Int skills, proficiency with simple weapons, firearms and light armor as well as full BAB-progression (because firearm-using classes totally need full BAB…) and good Ref- and Will-saves. The class gets an ancestral arm (pistol, blunderbuss or musket) “that is hard to wield without the years of doctrine and training” – okay, cool. Effects? RAW: None. There is a bullet flurry ability at first level, somewhat balanced by not being able to target the same creature (I think…) and imposing penalties on subsequent attacks, with 11th level providing a second, optional attack. The ability stacks with haste (non-italicized) and its wording is a bit wonky. Wanna hear something funny? The class gets a scaling precision-damage-based bonus damage at first level, +1d4, scaling up to +2d8. In second range increment or further, the bullet disciple is treated as -4 levels for the purpose of this damage. Because we all know that the issue with firearms was that they don’t do enough damage. 1st level yields Rapid Reload, 5th level nimble +2 (which upgrades every 4 levels thereafter by +1). 3rd level provides the option to ignore one cover between the bullet disciple and the target (not total cover) and 7th level provides Shot on the Run and starting at 11th level, the character no longer provokes AoOs with the gun and may not be disarmed of firearms and attempts to steal ammo may be countered with an unarmed pistol whip. 15th level yields 1/day a shot that ignores DR, hardness, cover and concealment. Nova, much? This is enhanced to 10 bullets at 19th level, which does nothing to make the ability more palpable. The capstone is a full-attack kill shot that manages to get the rules-language non-standard in spite of literally dozens of precedence cases. On the plus-side, the class gets a so-called doctrine at 2nd level, +1 every even level thereafter – these are talents that partially mimic deeds, partially allow for firearm modifications – only one modification may be applied to a given firearm, but the pdf fails to specify how long removing such a modification in favor of a new one takes. The formatting, obviously, is inconsistent here, but the abilities sport some gems – like keeping powder dry, or providing cover fire (which doesn’t specify if it takes up AoOs or not – assume no, but yeah…). Non-typed damage, failure to specify if unarmed penalties to kicks apply…The basics look well enough at first glance, but once you start dissecting the section, it starts showing strains. Ballistic Engineers gain a custom firearm that inflicts damage as though he was an unarmed monk of equal level, with Intelligence being added to damage rolls and replacing the default doctrine-list with only modifications and a couple of exclusive tweaks, including stacking threat modifiers (WTF) and adamantine bullets (or elemental ones) at 2nd level – the archetype shows a blatant disregard for how damage types, DR, etc. work – not starting with balance. The walking hurricane gets two pistols with an advanced capacity (1/4 character level), losing the flurry, and TWF (not capitalized) as well as better sundering abilities with the pistols…yay? None of the classes presented in this book get favored class options, just fyi. Editing and formatting are…okay, so, if you value, in any way, shape or form adherence to things like spells being italicized properly, like feats being in capital letters…you know, the very basics of formatting for PFRPG, then this’ll hurt you. Rules-language oscillates from still okay to “core ability RAW doesn’t work.” Layout adheres to a really nice two-column full-color standard with mostly solid stock art and the original pieces presented for the stand-alone classes. The pdf does have bookmarks, but not for all classes – and if you expected nested bookmarks for archetypes etc., I’ll have to disappoint you. At this length, not cool. As always with Wayward Rogues, highlighting and copying text from the pdf is impossible, which means you’ll have to copy the text BY HAND. Supremely annoying, to say the least. Robert Gresham, Aaron Hollingsworth, Rodney Sloan and Jarret Sigler had a chance to do it right. (I assume some of the authors of one of the classes wanted to be left out – otherwise, this does not credit the authors of the vivisectionist, easily the best part of the book.) When one of my patreons tasked me to review all the Wayward Rogues material, I didn’t think I’d have to bash quite as much as I had to so far. I frankly feel like a bully and I don’t like that, but there’s no sugarcoating it. While thankfully better than the first compilation, this leaves a lot to be desired. Problem one is the obvious lack of an editor. I have never, in all of my PFRPG-days, seen a compilation that so consistently ignores basic formatting principles. While a rules-editor would have most definitely helped, this isn’t necessarily what galls me most about this pdf. It is evident that the classes were copy-pasted from their initial releases. No additional development or editing pass was provided; all typos are still there; all ambiguities. And then there would be the dimensionist: Either the stand-alone file has been seriously revised (and lost some crucial information), or this book has the revised version – which plays less interesting and has its own share of issues. Neither version is up to the standards of the 3pp-industry. This all is particularly galling, when a single afternoon could have fixed pretty much EVERYTHING in this book. Well, a lot of it, anyways. Even if the more broken classes had been left untouched, at least fixing those that almost get something amazing done right would have elevated this pdf. But no. The bullet disciple, just fyi, while not the worst iteration of the by now very old trope, is also not the best one and sports the same categories of glitches and hiccups as the other classes. Not one of the options herein can be run RAW, without requiring some GM-intervention in the rules-department. Ultimately, I cannot recommend this pdf – from the accumulated issues to the disabled text-parsing and associated comfort detriments, this compilation falls flat of what it could and should have been. And don’t get me started on diversity, choice, and the finer details of class design – aesthetics don’t even feature in this rating. Ultimately, I can’t go higher than 2.5 stars, rounded down for the purpose of this platform. You can get this compilation here on OBS.